You know the Milgram experiment? This was back in 1961, shortly after Nazi leader Adolf Eichmann's trial started in Jerusalem. Test subjects were instructed to push a button that delivered an electric shock to someone else - someone they couldn't see - when they answered a question incorrectly. It wasn't a real electric shock, but the subjects didn't know that. They were also told that the shocks increased in strength with each incorrect answer. As the experiment went on, most test subjects continued pushing the button, despite screams of pain and pleas for them to stop from the other person. They followed the orders of the experimenter to continue even when they didn't want to, even when they believed they were causing another human being extreme pain, possibly to the point of death. Pretty disturbing implications there on humans' willingness to follow orders from authority figures, even when they contradict our individual consciences. Obedience is not always a virtue. Kenneth Worthy links this to willingness to make choices that are against the societal norm but less harmful to the environment. The irony is that a personality disposition normally seen as antisocial—disagreeableness—may actually be linked to “prosocial” behavior. This connection seems to arise from a willingness to sacrifice one’s popularity a bit to act in a moral and just way toward other people, animals, or the environment at large. When the priority is not rocking the boat, being seen as agreeable, and avoiding any hint of disagreement or conflict despite the consequences, maybe being "nice" isn't all that "nice" after all. Give me "contrarian...personalities" any day! 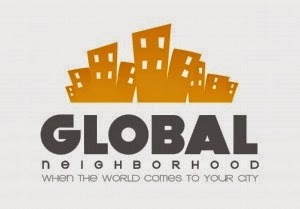 Global Neighborhood is a local non-profit organization in Spokane, Washington, focused on helping refugees adjust to life in the United States and become self-sufficient, integrated members of society through "employment, education, and empowerment". They employ refugees at a thrift store down on Indiana (which I have patronized many times), at a cleaning service they started earlier this year, and at a screen printing business. Global Neighborhood provides support for refugees from dozens of countries including Afghanistan, Burma, Vietnam, Eritrea, Turkey, and Uzbekistan, among others. Coming to a new country, particularly after the upheaval of war, tragedy or disaster in your homeland, must be incredibly disorienting. I'm glad this organization - overtly and unashamedly Christian - is reaching out to those in need of a friendly helping hand. I love the focus on empowering refugees to provide for themselves and their families by earning a paycheck and learning valuable job and life skills. Of course, monetary donations are helpful, but you could also volunteer to sort donated items at the thrift store or donate clothes, shoes, or household items yourself - they'll even schedule a pick up if you'd like. You could consider hiring Blue Button Apparel to make (environmentally friendly!) t-shirts for your next family reunion, or check out GN Clean if you're in the market for cleaning services. The Liahona Children's Foundation "is a grass-roots organization dedicated to nurturing the potential of children to lead healthy and productive lives." Malnutrition during the first few formative years can lead to life-long deleterious effects. LCF targets those children ages six months to five years in resource-poor countries who meet the World Health Organization's criteria for malnutrition, and provides nutritional supplements for them and education regarding the benefits of breastfeeding, hygiene and healthy food to their parents. LCF is making a difference to some of the most poor and needy in the world. While the LCF uses the already-established structure of LDS stakes in Africa, Latin America, the South Pacific, and Asia to efficiently gather information and resources and spread the word, no children in need are turned away. Dozens of stakes are available for adoption, or you can join the efforts of one LDS blog to assist the Ta Khamu stake in Cambodia, as I did. Of course, working in your own child's classroom brings the benefits of seeing your child in a different environment, getting to know their friends, and building a relationship with the teacher. I especially admire those who give of their time without the motivation of those benefits. There's one older woman - easily a grandma - who volunteers as a reading tutor every week at my kids' elementary school. She consistently works one-on-one with the children who need the most help and loves and encourages them through the rough patches. Even if your children are grown, perhaps the local elementary school needs just what you can offer. Even if you still have other small children at home, perhaps you can find another mom to swap babysitting with so you can each help out for an hour or two. Even if you can't commit to an ongoing regular schedule, perhaps you have a free hour this week you can offer. These young kids, at the very beginning of their education, deserve the best start we can give them and an hour or two can make a huge difference.